I added this book to my TBR pile because it was described as an early example of Gothic Horror combined with psychological realism. The description is spot on. 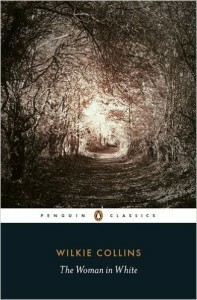 I started reading with the expectation of a spooky little Victorian thriller. What I got was over 600 pages of intrigue, madness, and of course, a love story. The Woman in White is a surprising work of fiction that needs to be made into a PBS miniseries, stat. Though the story is centered around the fortunes (and misfortunes) of Laura Fairlie, she is not a particularly interesting character. Those that surround her and move the action forward, Walter Hartright, Marian Halcombe and even the insidious Count Fosco, are infinitely more interesting. It is them that move the story from London, all across the English countryside and even to the madhouse (the Victorian repository for inconvenient women). Though there are a couple of slow spots, The Woman is White is, overall, a pretty thrilling read that kept me up later than I should have been on more than one work night. Share the post "A Surprise Adventure"
I am so glad to read a positive review of this book. I just started it and haven’t gotten very far into it.